Teens will see a bit of themselves in Dave, Julia, Gretchen and Brett. In this book, Adi Alsaid really gets teens (their highs and lows, their quirks, their isms) and for the teens that pine for others and do not do anything about it, Dave and Julia's friendship throughout high school with their Nevers list is reading they will love. Dave is such a nice guy, nice, genuine, caring. I wanted to love Julia but Adi Alsaid did such a great job showing how much Julia said and did was predicated on her very absent mom. It was so sad (Dave sees this) every time Julia's mom disappoints her and yet Julia yearns for a mom but gets a lukewarm long distance relationship from a selfish mom. So this broken connection made Julia self-centered, snarky, out there and unrealistic about many things. I couldn't put this book down; the romance, the wanting, the ache, the yearning make for a novel teens with be reading and sharing with each other. Make sure you read this book and join our twitter discussion with #yabookchat 10/4 at 9pm EST! 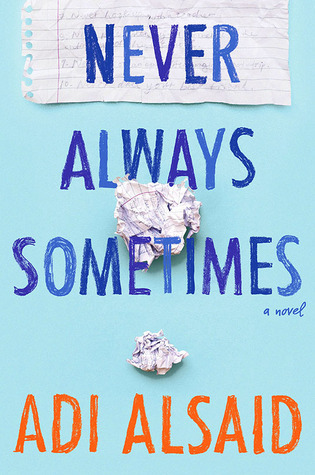 Sign into Goodreads to see if any of your friends have read Never Always Sometimes.